How do you define your digital marketing strategy? There has been a shift over the last couple of years that places content as the kingmaker. Online and offline not all content is alike though, so consider these important questions. Could content help build awareness and improve loyalty, simply by entertaining consumers? Can content help educate your consumers or the trade? Is there a need to inspire or persuade consumers who are working their way down the path-to-purchase? Might content serve as a close-agent, helping convert and making the sale? Here are some examples that make use the most effective content on the most appropriate channel to achieve the right objective. Aga have a brilliant branded lifestyle magazine that helps to both inspire and convince. Sharing stories with those real Aga owners, celebrity or otherwise. The online purveyor of Luxury Luxdeco, promotes a beautiful online magazine to inspire the discerning reader of opportunities to purchase. Smallbone of Devizes, a luxury kitchen company, provide a useful gallery feature to capture interest and inspiration for sharing, or purchase. And with 2.3 million views, as we look across to the luxury car industry (see Outlooking Part 2, What can we learn from Top Car Brands) its a rare moment when a luxury brand manages to Enterain AND Educate through Viral. In an effort to explain its Magic Body Control feature on Mercedes-Benz cars, they use an unusual, yet effective, display mechanism: dancing chickens. The team at Smart Insights put together a well designed inforgraphic that helps to illustrates how various forms of content can help achieve different kinds of objectives. 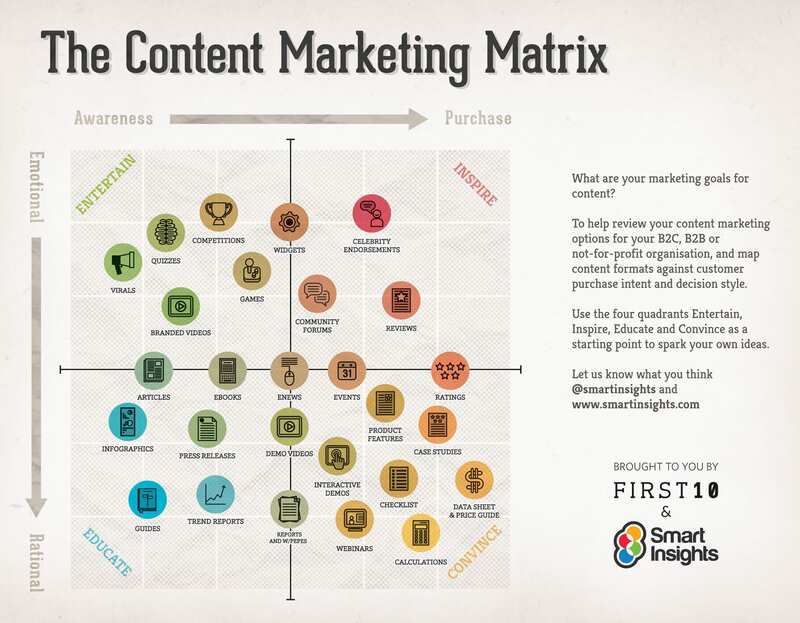 It’s a good matrix that helps you understand the right kind of content to develop for your brand. Here's a larger image.